The Hampton Court Palace Flower Show has strong associations with water. The palace gardens, bisected by a water channel and set beside the River Thames, make a fitting host for the unique Water Garden category. 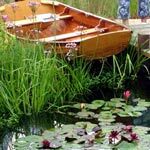 The six Water Garden entries ranged from the formal to the wild, and were presented by some of the UK water garden industry's 'heavy-weights' and regulars at Hampton Court. The water theme was not exclusive to the Water Garden category. Both Show and Small Gardens incorporated splash pools, galvanised steel water features, floating glass bubbles and liquid-filled clear walls. One Hampton Court sponsor even dedicated an entire pavilion to Show Gardens set along the banks of a created river. In keeping with RHS bicentenary celebrations, The Garden of the Four Winds described the voyages of the early plant hunters, sent by the Royal Horticultural Society 'in quest of seeds and herbarium material of plants at that time unknown to cultivation'. Many of the plants which these four men gathered are now common in our gardens today. In keeping with RHS bicentenary celebrations, The Garden of the Four Winds described the voyages of the early plant hunters, sent by the RHS 'in quest of seeds and herbarium material of plants at that time unknown to cultivation'.